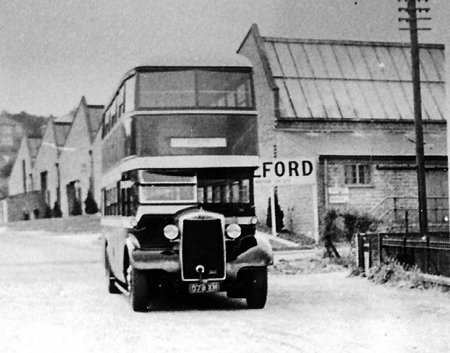 The above photograph (from the Dave Jones Collection) is of a Gilford Zeus outside the Bellfield Works in High Wycombe. This was Gilford’s third attempt to get into double decker vehicle market after the 168DOT and the failed front wheel drive double decker which was later converted into a trolleybus. Two were built, the first appearing at the Glasgow Show of 1932 before being registered in 1933 for use as a Gilford demonstrator before passing to Western S.M.T (Fleet number 723), and the second being sold direct to Western S.M.T (Fleet number 722). The two vehicles were originally fitted with different engines, the demonstrator a Vulcan Juno and the later one a Tangye VM6, but both are believed to have had Leyland oil engines fitted before entering service. A very smart modern-looking bus for its time, apart from the rather scrunched-up windscreen. The radiator suits the body style very well. I always had a soft spot for Gilford and was sorry it failed, partly due to the takeover of independents by newly-formed London Transport. Western SMT were staunch supporters of the marque at this time, taking quite a few coaches for their long-distance services. I wonder how long they lasted and their histories until scrapping. I was never good company at funfairs: a stomach not suited to revolving at high speed, restricted me to dodgems, big dippers, but certainly not waltzers! Thus, I tended to walk around the showmens’ vehicles and enjoy the fare on display there. I always remember seeing a Gilford Hera on one occasion, the only Gilford I ever saw. Don’t know when, but 723 transferred to Sandersons of Glasgow and I don’t know any history after that. 722 was withdrawn from service in 1944 and also transferred to Sandersons with no subsequent history. I have never come across a Gilford myself but every mention of them is always in a positive light – always said to be superb vehicles. As Chris says, circumstances – the customer base disappearing – overtook the firm with disastrous effects. I lived in High Wycombe for fifteen years and know Bellfield well – never realised that Gilford were based there. I don’t think they left a trace when they moved back to London. The very interesting subject of Gilfords reminds me that a group are restoring a single decker that started in life with Fred Oade of Heckmondwike. The company is still in business although nowadays they are undertakers the coaching side of the business was sold to Yorkshire Woollen in 1960. The vehicle is WX 3567 and was new in 1930. Oades sold it in 1934 and according to The PSV Circle it passed through several different owners and allegedly was sold for scrap in 1938 although obviously this never happened as I believe it was found in a barn. I actually saw ‘WX’ last week and it’s coming along. The survivor list may take some by surprise, with two vehicles, a DF6 and an AS6 I believe road-worthy, along with an AS6, a 166SD, two 168SD’s (one converted to OT) and a 168OT currently under restoration. There is also a Hera chassis at the SVBM. Would be nice to get them all roadworthy and together in the future – here’s hoping. Unfortunately Bellfield works has now been demolished so there certainly is no trace left of the company, and few people in Wycombe seem to know of their existence, something I hope to put right somehow. My father was a bus driver with Western SMT from 1945 till his retirement in 1976. His normal route was Irvine Harbour via Montgreenan to Kilwining Railway Station, wait 10 minutes and drive back. Only one single decker bus operated on this route. Due to the demand for the service on a Sunday a double decker was used. One Sunday my father forgot about the low bridge at Irvine harbour and took the complete top of the decker. For this he was suspended for a week without pay. Having no Driver the following Sunday, the Chief Inspector drove the route and put the decker under the same bridge. Father wages were duly restored. After WW2 there was a shortage of reliable buses. Western decided to buy bare chassis from Leyland and have them bodied at Alexanders Falkirk. All that Leyland supplied was a bare chassis and a temporary seat. drivers had to wrap up well and on some occasion had to be lifted from the seat as their clothes were frozen solid. After the war Western started their Glasgow to London night Service, on one Glasgow Fair 110 coaches left Glasgow in convoy for London, the journey time was 15 hours with refreshment stops there were no toilets on these buses. During the 1960’s a Day service was introduced. all the coaches were two driver operated as was the night service. Only the senior drivers were allowed on the day service and they got all the new and best coaches. The engines on these coaches had no engine governor and have been clocked at over 90 mph. The time was now down to ten hours, there were no Motorways at this time. The drivers would swap driving positions without stopping or reducing speed. The goal was to get into London Waterloo early, and give themselves more free time. In June 1967 my Father took delivery of the first Volvo coach with one piece wrap round windscreen. 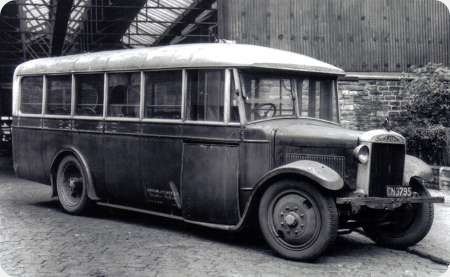 The coach was delivered factory fitted straight to the bus stance at Glasgow, it had not been checked over by Western mechanics. I was on this coach on its return journey from London To Glasgow. We were traveling on a dual carriageway when we were overtaken by a lorry with a flapping tarpaulin the Tarpaulin caught the driver mirror swung it through the windscreen. due to the increase in internal pressure the back window popped out. Midland Red had an agreement with Western in the event of an accident or breakdown they would supply a replacement coach in this case the replacement would mean a six hour delay. The drivers on consulting the passengers decided to press on, the weather was dry and sunny temperature approx, 24 degree’s. Two miles after turning at Scots corner a rear tyre punctured caused by going over windscreen glass. The coach had a spare wheel and nut runner but no jack. The lorry following us was driven by an ex-colleague of my fathers who just happened to have a heavy duty jack, 15 min’s. later we were back on the road. the coach arrived in Glasgow 5 min’s behind schedule. The tips for each of the two drivers were more than a weeks wages each. We stayed in Fenwick at that time. during WW2 there was a bus service. Ayr via Kilmarnock and Fenwick to Glasgow with a bus frequency of one every 90 seconds and the buses were packed. The regulations during the war were 28 standing downstairs and 12 standing up stairs. There is the chassis of an ex-Alexander Gilford Hera on show at the Scottish Vintage Bus Museum. It has a Leyland petrol engine taken out of a Titan converted to diesel. 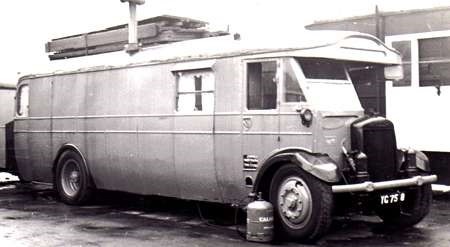 Having just noticed the comment about this bus being sold to Sandersons of Glasgow in 1944, the Sanderson family traded at the time as Millburn Motors and were dealers and breakers. At later dates they owned controlling stakes in Lowland Motorways and Northern Roadways, the dealership later became S & N Motors.